AFS offers a portfolio of intercultural opportunities relevant to teens and young adults. HIGH SCHOOL EXCHANGE: In 2017, we celebrated the 70th anniversary of our pioneering AFS High School Exchange program founded by the heroic AFS Volunteer Ambulance Drivers who served in World War I and II. The brave men had the noble vision to help young people build bridges across cultures while still in school. 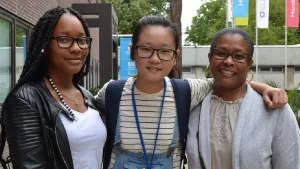 Last year more than 8,000 AFS students attended a semester, trimester or year-long high school exchange program, living with a host family and going to a local school. 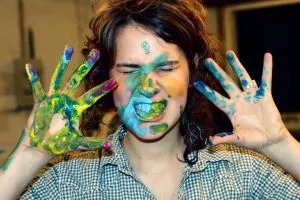 YOUNG ADULTS PROGRAMS: The Danish Folk College is a unique concept described as a “School of Life,” with no academic requirements for admittance, and focused on helping young adults develop self-awareness, interpersonal and intercultural skills. This program is organized by AFS Denmark. REGIONAL EXCHANGES: The ninth edition of AFS’s European Citizenship Trimester Programme (ECTP) in 2017 attracted 289 teens from more than 25 countries. This three-month-long study abroad program facilitated by the European Federation for Intercultural Learning (EFIL) offers workshops on the rights and responsibilities of European citizenship, what it means to be an active citizen, and includes visits to the European Parliament and the European Commission in Brussels. CLASS EXCHANGES: For more than 25 years, AFS Italy (Intercultura) has been running class exchanges: week-long intercultural study abroad programs for groups of students and teachers from Europe and beyond. So far, more than 1,400 classes, with over 28,000 students and 2,800 teachers participated in class exchanges. Driven by teachers, each class exchange focuses on a different topic, related to intercultural learning and the UN Global Goals. VIRTUAL EXCHANGES: AFS India developed a Virtual Class Exchange Program with schools identified by AFS Russia, AFS Turkey, and AFS Mexico. 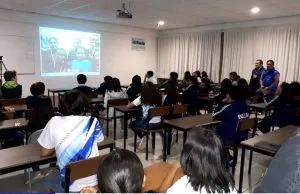 More than 500 students connected through video conferences and emails to explore topics like climate change, culture and heritage. GLOBAL CHOICE: Launched in 2013, AFS New Zealand’s Global Choice program students are hosted by families in New Zealand in the area, type and duration of a study abroad program of their own choosing—focusing on academics, English language, sports, nature or the arts. Almost 50 students participated in Global Choice programs in New Zealand in 2017 on programs lasting from two weeks to one year. DOMESTIC EXCHANGES: “Turkiye Kardesleri” fosters understanding between different cultures in Turkey, and promotes the value of multiculturalism in a democratic society. Managed by Türk Kültür Vakfı (AFS Turkey) and AFS Volunteers Association of Turkey, the nine-day scholarship program includes community service. More than 300 students, 30+ teachers and 20 schools have participated since it was launched in 2015. GLOBAL PREP: The Global Prep concept was originated by AFS USA and explores a range of relevant topics for teens, such as the refugee crisis in Hungary, STEM studies in Germany and wildlife conservation in Kenya. In 2017, 15 U.S. students went on a fascinating two-week Global Prep Islamic Culture and History in Egypt program developed by AFS USA and AFS Egypt. GOVERNMENT-SPONSORED PROGRAMS: Local and national government agencies continue to partner with AFS to deliver programs. In 2017, Australia’s Department of Foreign Affairs and Trade selected AFS Australia to manage the Australian phase of the Australia Indonesia Youth Exchange Program (AIYEP). Now in its 36th year, this program provides Indonesian and Australian young adults with the opportunity to complete internships and community service, as well as to live with host families in each other’s countries. The Kennedy-Lugar Youth Exchange and Study (YES) Program is an innovative high school exchange program funded by the U.S. Department of State’s Bureau of Educational and Cultural Affairs. 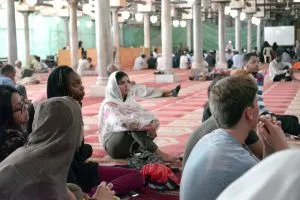 This public diplomacy initiative builds bridges of international understanding, especially between Americans and people in countries with significant Muslim populations. As of 2017, AFS has 4,275 YES program alumni from the USA and 12 other countries. The YES program has been transformative for many students, such as AFS alumna and Secretary of YES Alumni Malaysia Celine Yew Lin Lean (Malaysia to USA, 2013), who is blind. Lean says the exchange experience helped her realize that disabilities are not barriers. Living abroad encouraged Lean to follow her passion to help the underprivileged. Lean was instrumental in launching “The Gift of Sight,” which improved books and learning materials for students of the only school for the blind in Malaysia. HOST FAMILY PROGRAMS: For 70 years, AFS host families have welcomed international students into their homes. Long considered a key element in the well-being of exchange students, host families provide so much more than shelter and meals. Supported by dedicated and trained volunteers and staff, host families help students navigate their new schools and communities. In return, hosting provides an amazing cultural adventure for more than 10,000 families every year, like the Carrelet family from AFS France who hosted Xi Xu from China (pictured below). Many host families are guided through their own intercultural learning journeys to help them become global citizens without leaving home. AFS VOLUNTEER PROGRAMS: More than 43,000 AFS volunteers deliver our programs. They match AFS students with host families and help everyone get to know each other. Our volunteers liaise with schools and introduce participants to their new communities. 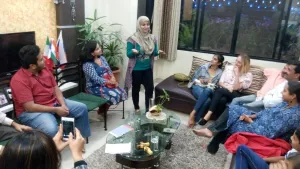 Volunteers also guide participants through group orientations and individual intercultural learning journeys. Regular check-ins with students and families are the hallmark of the AFS volunteer experience.